Operation Olive Branch will be conducted swiftly and will aim to create 30-kilometer-deep safe zones in Syria's Afrin, Prime Minister Binali Yıldırım told reporters Sunday. Speaking to reporters in Istanbul, the prime minister said that the main goal of the operation is to ensure security in Turkey and that the operation would be conducted in four phases. He referred to earlier reports of rockets, which were fired from People's Protection Units (YPG)-held territory in Syria and targeted Turkey's southeastern Kilis province. Yıldırım said that six rockets have been fired from YPG-held territory, injuring two people in Kilis. 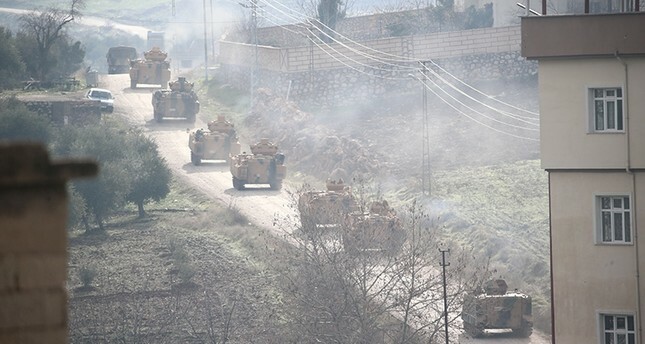 The prime minister noted that Turkish ground units have entered Syria's Afrin as of 11:05 Sunday morning. He highlighted that there are around 8,000 to 10,000 terrorists in Afrin and that Turkey is determined to clear all terrorists in the area. "We're extending an olive branch to innocent people," Yıldırım said, adding that the operation aims to ensure security in the region by cleaning out terrorists, who pose a threat to Turkey and civilians in the area. Meanwhile, Yıldırım also said that the U.S., which supports the YPG-dominated Syrian Democratic Forces (SDF), has not shown an antagonistic stance regarding the operation, and Iran has also not opposed it but has expressed some concerns. He added that Turkey has also informed the Syrian regime through Russia and Iran. When asked about the military's actions in case the U.S. provides logistic support to YPG terrorists, the prime minister said: "Any kind of logistic support is our target." The prime minister added that Turkey's economy will not be affected by the operation in Syria's Afrin and will continue to grow strongly. Turkish Armed Forces backed by armored vehicles, special forces and infantry regiments advanced 5 kilometers (3 miles) inside Afrin as part of Operation Olive Branch, according to Anadolu Agency report. During the movement, no major clashes took place.